sweet maggie miss magnolia was beside me in the jeep. and the birds are silent and no squirrels are about. it looks much the same. there are more leaves on the ground. more thankful for this fog. leaving us to our own magic for a while. if you turn right at that first street you may see him. and perhaps he is already gone. but perhaps he is the beginning. i hope he has a cigarette and wings. when i look at this picture i think "follow the red brick road...."
such a lovely brick road. 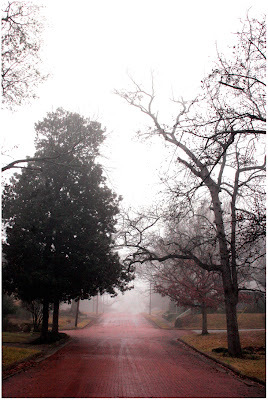 a red brick road, what enchantments lie there? I love seeing the street where you live and imagining a coyote just around the corner. Happy day after Thanksgiving!